Boplaas, like all the best South African wine farms, comes with a story. But the story of how Boplaas happened upon its unlikely Portuguese connection is one that has all the makings of a great comedy. As an added bonus, they also make a great wine. From behind tall, untamed grass, a windscreen flashes as it catches the sunlight. A trail of dust rises abruptly into the air as a 1970s Chevy El Camino cuts through acres of farmland along a dirt road on the outskirts of Calitzdorp. Inside the car, a smile cracks on Oupa Danie’s face. He is almost home – and better still – he has returned victorious, with a carload of Shiraz and Pinotage from the nearby Swartberge, clanging restlessly as he navigates the unruly terrain. It was a legendary feast. By the time the last drop of vino fell, Oupa Danie Nel – spurred on by an air of unencumbered enthusiasm from his friends and neighbours – declared that henceforth, Boplaas shall be a Shiraz-growing farm to rival those of his beloved Swartland. And so it began. Shoots were planted, vineyards grew, flourished even, and for the best part of a decade, Oupa Danie became famed for his exemplary Shiraz. That was until his son, Carel – fresh from university as a newly qualified Oenologist – took a closer look at his father’s vineyard and discovered that he was, in fact, growing Tinta Barocca. There might have been a moment in which an unpleasant word or two were spoken, the details are unclear. But Oupa Danie was never one to let a tiny detail get him down. His unusual Shiraz might have revealed itself to be something else, but one thing Oupa Danie knew was that he could grow. As for the rest? It was nothing a visit to the experts couldn’t put right. And so, father and son journeyed to Portugal – the quest for the perfect Shiraz becoming a mere memory that grew fainter with each passing air mile – and befriended many of Duoro’s top Port producers. There, in the heartland of Port, amidst the marriage of sunlight and water, the Nels learnt the art of making fortified wine. Today, Boplaas still clings strongly to its Portuguese connection, growing Touriga Naçional, Tinta Barocca, Souzão and Veldelho varieties. By great good fortune, the Calitzdorp terroir – with its rich, ancient alluvial soils and marked day-night temperature differences – is ideal for these hardy vines. And one generation on, Margaux Nel, Carel's daughter, has taken over the reigns as winemaker at Boplaas. Like her father, she too has a strong academic foundation, and did her MSc research thesis on the Portuguese variety, Touriga Naçional as a red table wine in the Klein Karoo region. 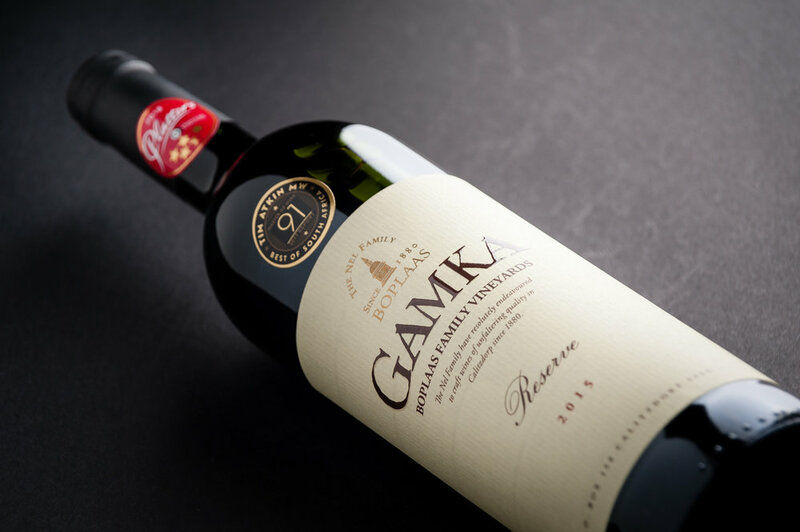 The Family Reserve Gamka gets its name from the nearby Gamka River – named after the Khoisan word for lion – which has been the lifeblood of this part of the Klein Karoo since the Nel family settled here in the mid 1800s. When in flood, this usually placid river roars through the ravines, wreaking havoc on anything that dares to cross its path. Bright garnet red wine billowing from the glass with black hedgegrow fruits, tart cranberry, ripe plum notes, spice and fynbos. The fruit buttressed by fine oak tannins on the savoury palate with hints of fynbos, charcuterie and bacon fat rounding out the wine. This full-bodied dry red table wine is the perfect accompaniment to any braai, particularly, heavier red meats. In winter, try it with a hearty lamb pie with mint for the ultimate comfort meal. It also goes well with most cheeses. For more information about this gorgeous wine, or to buy it, visit Boplaas Wines online.